Navigair Service Agreements are the best way to optimise engine operation over time. 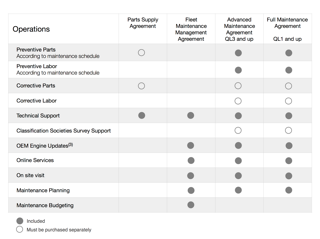 Our Service Agreements offer many benefits to operators such as maximized engine availability, reduced lifecycle costs and cost budgeting. Our Parts Supply Agreement ensures you parts supply at a preferred price based on annual volume. It provides access to Technical Support. Our Fleet Maintenance Management Agreement is specially designed for Fleet Managers and includes Maintenance planning and budgeting, on site visits and OEM Engine Updates. It provides access to Technical Support and Online Services. Our Advanced Maintenance Agreement covers preventive maintenance at a fixed price for parts and labor. It provides access to Technical Support and extended services. This agreement covers maintenance tasks Qualification Level 3 and above(1). Our Full Maintenance Agreement covers preventive maintenance at a fixed price for parts and labor. It provides access to Technical Support and extended services. This agreement covers maintenance tasks Qualification Level 1 and above(2).